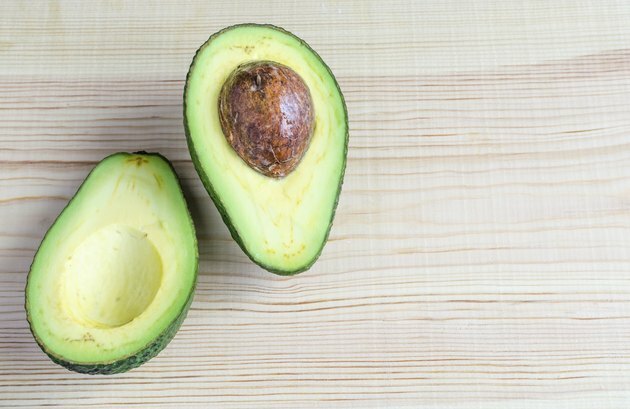 One half of a California avocado has about 10 grams of fat, much more than most fruits and vegetables. The good news is that most of the fat is monounsaturated fat. Monounsaturated fat and polyunsaturated fat are called healthy fats because diets high in these fats are linked to many health benefits, such as reducing the risk of heart disease. For the healthiest diet, replace foods high in saturated fats (butter, high fat meats and cheese) with foods high in unsaturated fats (avocados, vegetable oils, most nuts and seeds). One half of a California avocado has almost 7 grams of monounsaturated fat and only 1.5 grams of saturated fat. The rest, about 1 gram, is polyunsaturated fat. The ratio of unsaturated fat to saturated fat in the avocado is similar to olive oil.